Trust in him? Trust in Jigsaw? Yes! 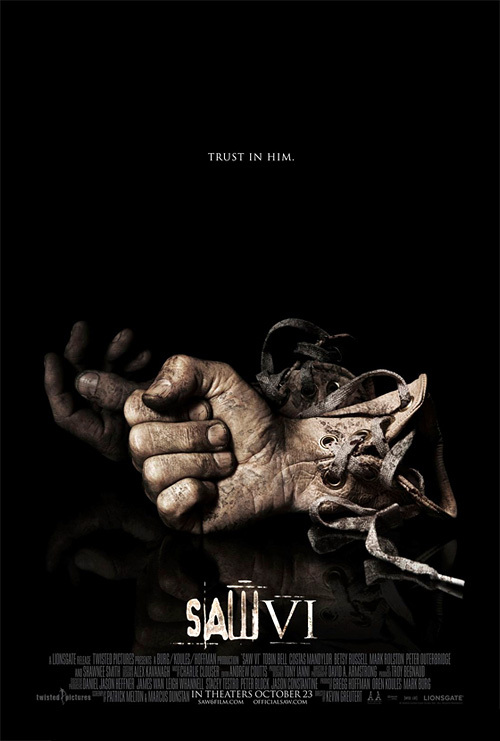 ShockTillYouDrop has debuted another new teaser poster for Saw VI that doesn't have much on it - except for a rad par of boxing glove hands and that tricky tagline we just mentioned. I'm glad we're back to the norm with these posters. I hated the first motion poster for Saw VI, I liked the second Comic-Con one featuring a brand new trap on it, but this one definitely shows they're back in business. It's a lot like the poster for Saw V, that had some guy wearing a Jigsaw mask on it. Now they've made Jigsaw gloves, which is freakin' creepy and awesome. I love that they're pushing the MPAA limits. This is so lame, I can't believe people watch this garbage. A humand hand glove, are you serious. I REALLY like the look of this poster, never been a fan of the films, but I like the direction they are taking. #2 - I agree with you, something about this poster really looks fantastic. I really like the reflection effect on the bottom of the two handgloves, and where the 2nd glove hand is faded in the back. Very creepy and amazingly effective. Nice job Lionsgate on this poster. I think I'm missing something where the 6? the 5 fingers of the front glove and the thumb of the rear glove make 6. its a stretch, but its the only relevant finger in the other glove. Love this poster... they are having a big discussion over at Shock Til You Drop as to what it all means. @1 - if you don't like the Saw movies then why click on the news link about Saw? It is a rather pointless exercise coming in here bagging out the series when it is already the highest grossing horror series of all-time. @1 - PISS OFF!!! I can't wait for this, seen every Saw film on opening day for five years in a row, time to make it 6. @4 - His cancer is his hatred of how humanity has become, and that is what is spreading. @10 - yeah, the artwork outshines the films themselves, but some may glance at this and think it's for a boxing flick. Always loved the two fingers for Saw 2 best though. # 1 Human hand glove. Maybe this new director will bring something new to series, and redeem Saw for a few let down fans, but I've remained a stedfast fan since the first one, so I stoked for this. @13, What! are you kidding, BRAINS!! !, this movie never had brains, the writers made all the characters around the killer a bunch of idiots. This was the only way the writers could make this lame story work. The saw series is for people who don't think and are easily amused by mediocre horror story concepts. Uh... @1 and 15... You're the one who seemingly doesn't understand the symbolism behind the human hand glove and thus, simply points to it as "lame". And yet you say the series is for people who don't think. So are you saying it's for you? Wow, symbolism. I guess that is all it takes for a series to be smart now, that totally saves the series now. @17 No, that's not all it takes to be "smart" now...but it does take a certain kind of fool to negate things based on preconceptions or bias rather than to use the knowledge available to them to form an opinion or stance. And it seems evident, from your largelynegating the series as a whole - rather than elements within it - as valid to some extent, that you're prone to making over-generalized statements about the series, its fans, etc. I'd like to see you address the actual flaws within it (there are a good deal) rather than just say the series is for people who don't think. But it would seem it's likely that you wouldn't take the time nor effort and would write that off as "not wanting to waste your time"...or you would make a list, but it would be full of even more over-generlizatizations and misinterpretations...or something similar. And yet you claim that the fans of the series are those that "don't think". If you don't see the flaw in that line of logic, it becomes even more evident that you are the one who enjoys "not thinking"...regardless of what audience the series may cater to or not. Hmm what audience it caters, to. Well since you ask for specifics, I guess I can bring a few. The first film, which is the backbone and what drives the rest of the series was poorly executed, I can give you that the concept is original but that is it. The writers could not even get simple things like the detectives not following basic detective procedures. Example: when they found the suspect, they hide and even allow the suspect get near the victim that is tied to the chair with the drills. It does not stop there, then the suspect activates the drills and the detectives with their guns drawn ask” where is the key”, since when does a cop with a gun ask for a key when he would immediately just shoot the power cable. Then instead of securing the suspect by having him lie down , no Danny Glover has him on his knees, allowing him to somehow cut him in his throat, and then his partner deserts him when he has a fatal wound, again, not following basic procedure. I have more but there is not enough room in the forum. You want to talk about a smart horror serial killer movie, watch “ SEVEN ” written by Andrew Kevin Walker. Instead of truly making the bad guy a smart character, the writers made the supporting cast a bunch of idiots in order for him to be able to do achieve his evil deeds. I guess if the movie caters to people that like mediocre B horror flicks, than this takes the award. I know a lot of people that love the series but don’t give a title that it does not earn ” SMART” is not part of it. Wow. I'm surprised you actually did it. Most people just run off without any valid points. Bravo. Thank you for proving to me that not everyone on the internet is someone who bases their opinion on random preferential garbage rather than what they actually observe. The series is what it is. Like most other "sequelized" horror...it starts to become so self-referential and nonsensical - especially after awhile - that, regardless of any potential merits, it's hard to take it seriously. I'm not sure if that's a valid reason to put down those who find it has value as escapist entertainment, however. I imagine some of them might watch it solely because they spend all day doing something rigorous and/or complex and would like an escape, so they enjoy watching a vaguely intricate, non-linear, fairly contrived horror film/series. I doubt many discerning fans would call the series a masterpiece or anything, but I can see a lot more value in a series like this - which is seemingly still trying, to some extent at least - than I can in the rehashes or remakes of the Friday the 13th-like films which, although they may have a few innovative elements, tend to become so mind-numbingly repetitive that if you accurately played a drinking game with them, you'd die in about ten minutes. Well said sir, well said, my Hat is off to you. I am starting to really hate this movie.